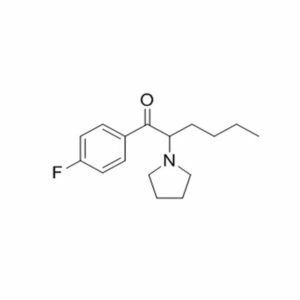 4F-PHP(aslo known as 4-fluoro-php) is a synthetic stimulant drug that has been sold online as a designer drug. It is a analogue of α-PVP. This product is intended for forensic and research facilities and is NOT intended for human consumption.Research on compound was published by ACD/Labs’, US Environmental Protection Agency’s EPISuite, and ChemAxon. In the reports by ACD/Labs the chemical has 2 hydrogen acceptors, 0 hydrogen donors, 5 freely rotating bonds, an index of refraction of 1.538, with a surface tension of 40.0±3.0 dyne/cm, a flash point of 119.0±12.5 °C and a boiling point of 340.8±25.0 °C at 760 mmHg.